How often do you find yourself saying "I wish I knew how to save hundreds of dollars on sewing machine repair bills!" With this simple course, you can learn how to repair your own sewing machine from the comfort of your own home in 30 days or less... GUARANTEED! Can you imagine also owning your own part time sewing machine repair business that could bring you in $30,000 a year or more? This course will teach you STEP BY STEP on how to become your own expert sewing machine repairman. Descriptions of typical sewing problems, along with an explanation of their usual causes and easy solutions. how to thread all different styles of sewing machines, and how to wind the bobbin and select the correct needle. how to properly clean and lubricate all the different sewing machines, and how to check the various parts for wear and breakage. I will show you how to check for problems such as noisiness, thread breakage, needle breakage, poor stitching, skipping stitches, etc. how to straighten the needle and presser bars and level the presser foot on all sewing machines. how to check motors, lights, controls and wiring for various problems. how to properly time the needle bar, the hook or shuttle, the feed mechanism, etc., so the sewing machine will sew perfectly on all types of material and guarantee YOU satisfied customers. how to set the tension on all the different sewing machines by using an actual gauge in this intricate setting.There are even sample repair tickets made out on sewing machines so you'll know how to make charges for your service. where to purchase wholesale parts and new sewing machines, including where industrial machines can be purchased wholesale. 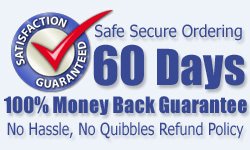 Your satisfaction is assured through our no-risk money-back guarantee. If for any reason you aren't thrilled and satisfied with our product, just contact us within 60 days and we'll refund 100% of your purchase price. No hard feelings. We want to make this a complete "no-brainer" decision for you and ensure that you are absolutely ecstatic when you purchase this "How To Repair Sewing Machine" course. You will also receive these BONUSES for FREE worth $285.00! Total of 964 Pages + "How to Repair your Sewing Machine At Home"